The temptation to knee-jerk in response to the slogans, cliches and memes of the parties we statistically disagree with the most can be overwhelming. Oftentimes, this can lead us to a fatal error: we form our opinions due to antagonism rather than rational deduction. When Hillary Clinton says, 'It takes a village to raise a child,' this statement is not inherently factual nor is it inherently false, and yet, many of us suspect that the way that it was meant to be interpreted lies on a series of false premises or would lead, as Mrs. Clinton would have it, to a world in which more and more money goes to state-subsidized programs over which we have little to no control. But rather than playing this out to its conclusions and keeping the inadequacy of this type of metaphor in check, many people simply take up the opinion that it doesn't, in fact, take a village to raise a child on the a priori grounds that Hillary said it, so it must be evil. I'm not interested here in discussing the moral character of the Clintons, nor of any other specific political figures or movements. However, I would posit that even if it was a question of 'good' and 'evil,' evil is usually only successful where it cloaks itself in some good. Ideally, one would want help from the village to raise a child if such was an option. However, we don't live in villages here in the west, and even places that resemble villages are full of alcoholism, pedophilia, mass consumerism and family units just as broken and atomized as those found in any cosmopolitan setting. People get more wrapped up in the words themselves rather than the intentions behind them. It is easy to call the other side evil. The other side may well be evil, but it does no good to stop here. There always comes the risk that, like Bane, the evil one will respond to the charge, quite pragmatically, 'I'm a necessary evil,' and crush your head without scruple. Liberals tend to fall back on tribal language, as Hillary Clinton did, to make a point, but the tribe in question is invariably the humanity tribe; a tribe which doesn't exist and never will. Tribes, communities, gangs, cliques, unions and nations will always exist, but there will never be a one world community, no matter what the Mark Zuckerbergs of this world think. As soon as tribal values recede from the global arena and play themselves out in real time, provincially, progressives cry 'heretic.' I'm not even talking about those who want some abstract ethno-state. They cry heretic about boring old, vanilla flavored federalists and have been doing so for years. But, keeping this logical inconsistency of progressives in mind, along with the discursive territory over which it claims dominion, perhaps we can test some general claims one hears in the west concerning these issues and see if there might be some deeper issue which causes us to debate our interlocutors until we're blue in the face without ever reaching any kind of conclusion which doesn't put us at odds with half of the population. Let's look at the bare essentials of the arguments surrounding gun control without resorting to vain, unproductive moral language. Let's forget about categorizing people into groups of 'good' and 'evil,' not because good and evil don't exist, but because these epithets don't actually describe anything until we can figure out what the main problem is. As a matter of fact, let's leave legal language out of it as much as we can too, not because we are against law ipso facto, but because it only complicates things when we're trying to solve problems which are bigger than the law anyway (i.e: who should have a monopoly on security?). What language are we left with then? We aren't left with easy labels (which mostly excludes what is all too quickly referred to as 'common sense' as well). We're left only with actions; in other words, causes and their effects. It would at first seem quite untenable to outlaw weapons altogether. 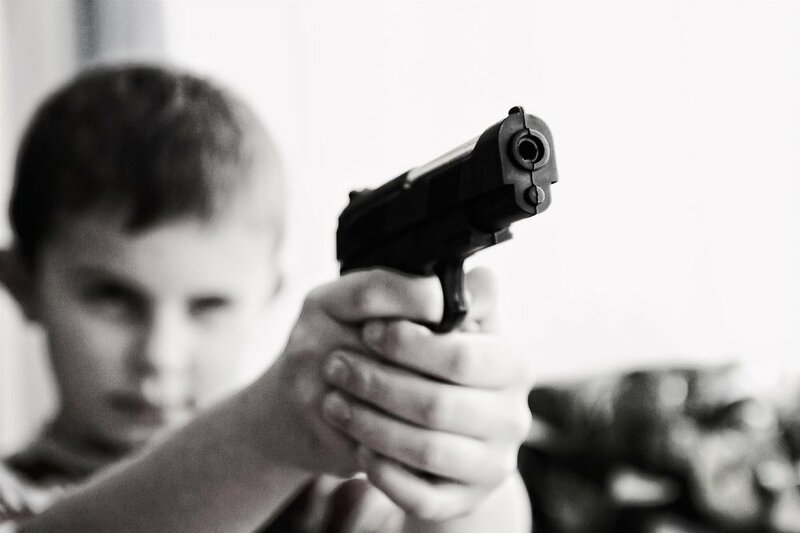 As many conservatives, libertarians and gun lovers in general have pointed out every time a gun buyback, gun ban or tighter gun regulations are mentioned by democrats, liberals and leftists, doing so would, at best, make criminals of upstanding, responsible citizens and, at worst, ensure that the only people who would have guns would be people who intended to use them violently. This is true by definition, but does this immediately lend us the opposite conclusion? That everyone in this country has a 'right' to own a weapon or that everyone should be in a position to hold tyrannical regimes accountable? I'm willing to concede to tribal language to make a basic point. What we're dealing with, ultimately, is a difference in values. But what are those values? It's much more specific than 'left' and 'right,' at least concerning this particular issue. Those who believe in the right to self defense wish for themselves and everyone else to assume an active role concerning the nature of violence. They are simultaneously pessimists and optimists. They are pessimists concerning the nature of violence, and rightly so. They don't believe you can outlaw or unilaterally do away with violence. Their solution, rightly, is to combat violence with violence, or the threat of violence. They are optimists in that they think that we need to simply put more guns into people's hands, which only 'solves' the problem in a wider philosophical sense. What they tend to take for granted is that the Nikolas Cruzs, the Anders Breivicks, Zhao Moumous and Tim McVeighs of this world will not be stopped by the mere intimidating idea that there are a lot of good guys around them who are legally able to purchase firearms. We must face the fact that there exist people who, for whatever reason, simply wish to prey upon large numbers of people at one time. Stephen Willeford performed his armed good-guy duty after dozens of people were slaughtered in a church. On the other hand, you have people who are against guns. They wish for themselves and everyone else to assume a passive role in relation to violence. They are simultaneously pessimists and optimists. They are optimists because they think that doing away with a tool will get rid of the job, and wrongly so. They are pessimists because they think that human agency is not a black and white issue, and this is probably about all they get right, though they are not exactly right in direct contradistinction to the reason libertarians and anarchists are often wrong on this issue, as they, just like these latter groups, tend to mistake a series of effects from one cause for a network of interconnected, easily narrativized natural conveniences. Rather, they are right to be distrustful of the notion that an active role in relation to violence should be carried out by anyone and everyone; that they should be expected to trust strangers to more expediently do away with one another. They are, after all, pressed up against a whole population of people with whom they disagree and fundamentally distrust in terms of what should be done with their shared space of land. The issue reverberates and perennializes an antagonism which becomes the border of antagonism as such. It becomes the issue about which we cannot remain one people if a certain breaking point was reached. And yet, both sides are willing to entertain the abeyance of any suggestion of a divisive split which would transcend mere political conversation. But the very mention of the word 'war,' though it would seem inevitable from a pessimistic view of the world, is actually a quite comical notion concerning this particular issue. How do people who don't believe in guns defeat people with guns? Naturally, one would posit, the military and the police would have to enforce their desired policies. This is assuming that people who, on the ground, would have to carry out the duty of disarming people, in fact, agree with them. Let's pretend they didn't, by some stretch of the imagination. What do you think would happen? Likely, nothing. Things would continue as normal. Only, there's a problem with this. It assumes that the mob expresses a cohesion of thought and agency which it doesn't have. The circular reasoning of this mentality goes: disarm yourself and us or someone will shoot you. How many people is one willing to put between oneself and the one to whom violence is being done so that one doesn't have to face the consequences of this power play? If bygones have so far not been allowed to be bygones, let me put it this way: There is no evidence to suggest that it is harmful to society that certain people want someone else to protect them from violence on their behalf. There is also no evidence to suggest that it is harmful to society that certain people should protect themselves from violence. Aside from the fact that human predators exist, it is untenable to suggest that those who do not want others to protect them on their behalf should, not only have others protect them on their behalf, but then be forced into a situation in which their ability to protect themselves is consciously impeded. For conservatives, libertarians and gun lovers in general, such an initiation of force would constitute that very act of the government 'going tyrannical;' an idea whose abstraction in the minds of most liberals and anti-gun activists would see them failing to qualify this act by such a phrase where it wasn't responsible for the death of six million Jews. Naturally, a difference in values is going to lead to a difference concerning what the supposed role of the government should be. Traditional lovers of the old republic might say that the government's role is to keep people accountable for their contracts. An egalitarian liberal or progressive would consider life itself and the well being of the individual the ultimate societal contract. Both views rely on bad faith. The former relies on the bad faith that a meta-contractual entity like government should be self-limited and limitable enough that it should be easy to usurp should it get out of hand - which begs the question as to why it should even be desirable to have a meta-contractual entity which is susceptible to such usurpation in the first place if it can get between you and what you want; after all, couldn't such an entity be usurped just as easily by a people seeking to defend themselves as by a people intending to perform a coup? It relies on the tautology that government works so long as people obey the government. The egalitarian, progressive model relies on the bad faith that the government is an absolute entity which is itself all-powerful and protective yet, somehow, entirely neutral; so neutral, in fact, that its neutrality can be manipulated and cajoled in favor of noble causes - a nobility which is incidentally contemporaneous with whatever makes people feel good without having to do anything to warrant such feelings. Several layers of disconnect cause people to look past what should, in a sane world, present us with an obvious set of problems. Democracy, unfortunately, is an incredibly efficient means of cloaking these varied power dynamics.